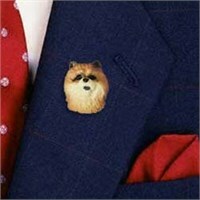 Nothing beats the exceptional look and quality of our Chow Chow Magnet. Among the finest made, you will be provided with great satisfaction and long lasting enjoyment. Why not pamper yourself or give a loved one a Chow Chow gift to show them how much you care. The Chow Chow Magnet will make the perfect gift for any Chow Chow lover. Shop with confidence, because all products come with a 100% customer satisfaction guarantee. Click over now to see the big selection of Chow Chow gifts we offer. Nothing beats the exceptional look and quality of our Chow Chow Mousepad. Among the finest made, you will be provided with great satisfaction and long lasting enjoyment. Why not pamper yourself or give a loved one a Chow Chow gift to show them how much you care. The Chow Chow Mousepad will make the perfect gift for any Chow Chow lover. Shop with confidence, because all products come with a 100% customer satisfaction guarantee. Click over now to see the big selection of Chow Chow gifts we offer. Nothing beats the exceptional look and quality of our Chow Chow Mug. Among the finest made, you will be provided with great satisfaction and long lasting enjoyment. Why not pamper yourself or give a loved one a Chow Chow gift to show them how much you care. 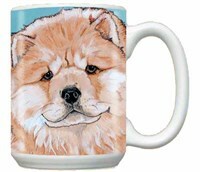 The Chow Chow Mug will make the perfect gift for any Chow Chow lover. Shop with confidence, because all products come with a 100% customer satisfaction guarantee. Click over now to see the big selection of Chow Chow gifts we offer. 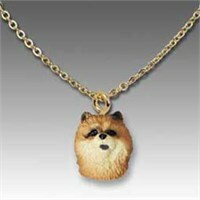 Nothing beats the exceptional look and quality of our Chow Chow Necklace. Among the finest made, you will be provided with great satisfaction and long lasting enjoyment. Why not pamper yourself or give a loved one a Chow Chow gift to show them how much you care. The Chow Chow Necklace will make the perfect gift for any Chow Chow lover. Shop with confidence, because all products come with a 100% customer satisfaction guarantee. Click over now to see the big selection of Chow Chow gifts we offer. This magnificent Red Chow Chow Note Holder will make sure that you never forget that important meeting. At approximately 6 x 2.5 inches our friendly Chow Memo Holder will always stand out on your kitchen counter, desk or anywhere else you decide to place it. 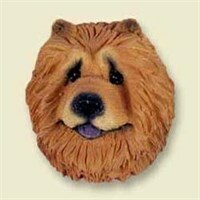 Or as a gift for a friend or loved one, this delightful Chow Chow Note Holder will always bring a smile. 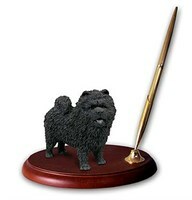 This magnificent Black Chow Chow Note Holder will make sure that you never forget that important meeting. At approximately 6 x 2.5 inches our friendly Chow Memo Holder will always stand out on your kitchen counter, desk or anywhere else you decide to place it. Or as a gift for a friend or loved one, this delightful Chow Chow Note Holder will always bring a smile. 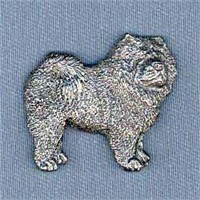 This magnificent Blue Chow Chow Note Holder will make sure that you never forget that important meeting. At approximately 6 x 2.5 inches our friendly Chow Memo Holder will always stand out on your kitchen counter, desk or anywhere else you decide to place it. 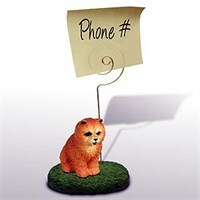 Or as a gift for a friend or loved one, this delightful Chow Chow Note Holder will always bring a smile. Perfectly divine, this darling dog will capture every heart in the room on this delightful Chow Chow Paw Wipe Towel. Your beautiful hairy companion will astound on this 13 x 18.5 inch machine washable towel finely made from White Terry Cotton. It also comes with a Hook & Grommet for hanging anywhere in your home, car, boat or any place that you bring your best friend. Our Chow Chow Paw Wipe Towel is an adorable gift idea that friends will be excited to use for several years. This spectacular Red Chow Chow Pen Holder will spruce up any desk or work station. With a beautiful wood plaque mount, an intricately designed figurine and a handsome gold tone pen, your new desk accessory is sure to bring up lots of conversation about your favorite friend. The Chow Chow Pen Holder is always a fantastic gift. 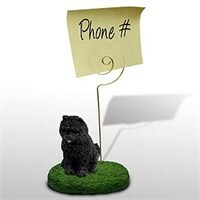 This spectacular Black Chow Chow Pen Holder will spruce up any desk or work station. With a beautiful wood plaque mount, an intricately designed figurine and a handsome gold tone pen, your new desk accessory is sure to bring up lots of conversation about your favorite friend. The Chow Chow Pen Holder is always a fantastic gift. 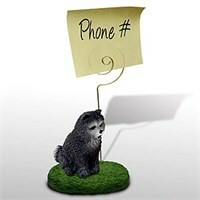 This spectacular Blue Chow Chow Pen Holder will spruce up any desk or work station. With a beautiful wood plaque mount, an intricately designed figurine and a handsome gold tone pen, your new desk accessory is sure to bring up lots of conversation about your favorite friend. 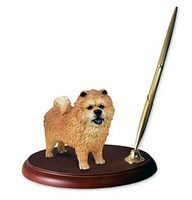 The Chow Chow Pen Holder is always a fantastic gift. 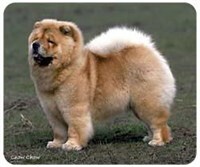 Nothing beats the exceptional look and quality of our Chow Chow Pin. Among the finest made, you will be provided with great satisfaction and long lasting enjoyment. Why not pamper yourself or give a loved one a Chow Chow gift to show them how much you care. The Chow Chow Pin will make the perfect gift for any Chow Chow lover. Shop with confidence, because all products come with a 100% customer satisfaction guarantee. Click over now to see the big selection of Chow Chow gifts we offer. 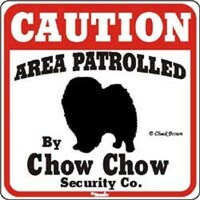 Nothing beats the exceptional look and quality of our Chow Chow Sign. Among the finest made, you will be provided with great satisfaction and long lasting enjoyment. Why not pamper yourself or give a loved one a Chow Chow gift to show them how much you care. The Chow Chow Sign will make the perfect gift for any Chow Chow lover. Shop with confidence, because all products come with a 100% customer satisfaction guarantee. Click over now to see the big selection of Chow Chow gifts we offer. Nothing beats the exceptional look and quality of our Chow Chow Socks. Among the finest made, you will be provided with great satisfaction and long lasting enjoyment. Why not pamper yourself or give a loved one a Chow Chow gift to show them how much you care. 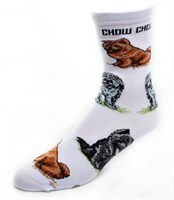 The Chow Chow Socks will make the perfect gift for any Chow Chow lover. Shop with confidence, because all products come with a 100% customer satisfaction guarantee. Click over now to see the big selection of Chow Chow gifts we offer. Pamper your peds with our pretty Chow Chow Socks Poses 2, a whimsical wardrobe addition that will be sure to get your feet some fabulous attention even when they are stuffed in your shoes. Made of a 75% acrylic and 25% stretch nylon blend, the colorful Socks feature these lookers with their great style in different directions. The Sock sets fit ladies size 9-11 and are fun and functional footwear that make great gifts for those who love these beautiful animals. Our Chow Chow Tote Bag makes a wonderful accessory for anyone who shares the energy of the Chow, and is always on the go. The marvelous lifelike portrait on both sides of these 17" X 17" Chow Chow Tote Bags instantly marks you as an enthusiast of discerning tastes, and you will get years of use out of its high quality, machine washable 100% cotton construction. 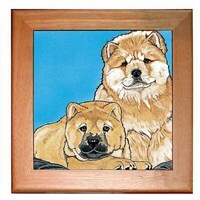 This is one gift that will keep on giving forever with your divine Chow Chow Trivet. There won't be a long face in the house when you showcase this beautiful 8 x 8 inch Trivet made with Soft Non Slip Cushions and a Pinewood Frame made right here in the USA. Heat Resistant for use as a Hot Plate, the Chow Chow Trivet also includes a Pre-Drilled Hole for Hanging. This sweet canine trivet makes the ultimate gift for any fan of this one of a kind breed. 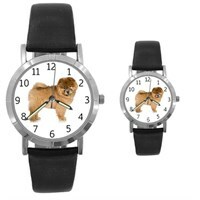 Time after time, you'll hear me say that I'm so lucky to be loving my Chow Chow Watch. Warm and wonderful, there is nothing like your best friend on this quality made Water Resistant Watch with Stainless Steel Back and Genuine Leather Band featuring a Lifetime Warranty. A perfect fit at 1 5/16" Diameter for Men and 7/8" for Women Your precious Chow Chow makes an outstanding gift and will tell perfect time every time with Japanese Quartz Movement. Nothing beats the exceptional look and quality of our Chow Chow Welcome Sign. Among the finest made, you will be provided with great satisfaction and long lasting enjoyment. Why not pamper yourself or give a loved one a Chow Chow Welcome Sign to show them how much you care. The Chow Chow Welcome Sign will make the perfect gift for any Chow Chow Welcome Sign lover. Shop with confidence, because all products come with a 100% customer satisfaction guarantee. Click over now to see the big selection of Chow Chow Welcome Sign gifts.